Take I-95 south to US 1/South Dixie Highway and continue to Stanford Drive. Turn right on Stanford Drive. Turn right on San Amaro Drive. 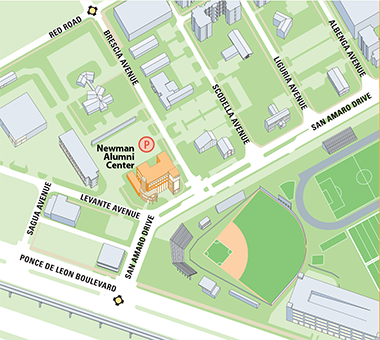 The Newman Alumni Center will be on the left, on the corner of San Amaro Drive and Brescia Avenue. Turn left to access parking located directly behind the building. Travel north on US 1/South Dixie Highway to Red Road (57th Avenue). Turn left on Red Road. Turn immediately right on Ponce de Leon Boulevard. Turn left on San Amaro Drive.